After arriving to the landing strip in Lukla, it took my team about a week to get to Everest Base Camp at 17,500 feet (5,300 meters). 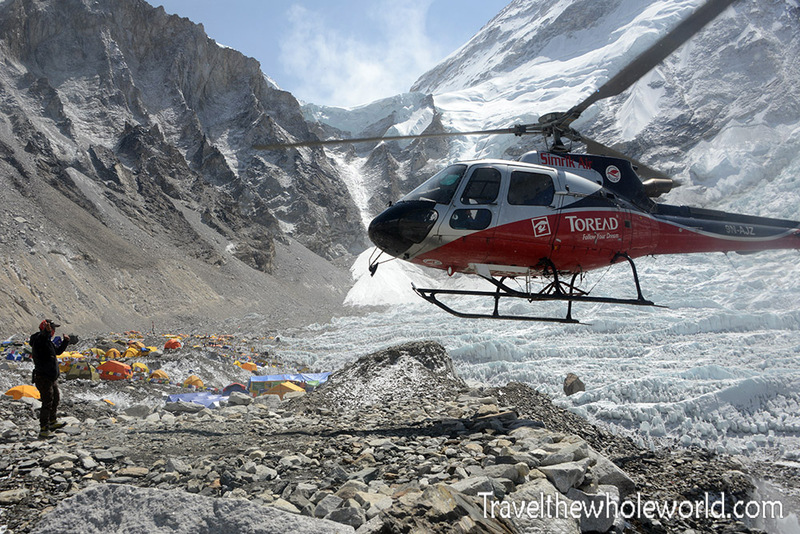 For the vast majority of the Khumbu Valley trekkers, this is their final destination. For us however, it was just the starting point to our big adventure! 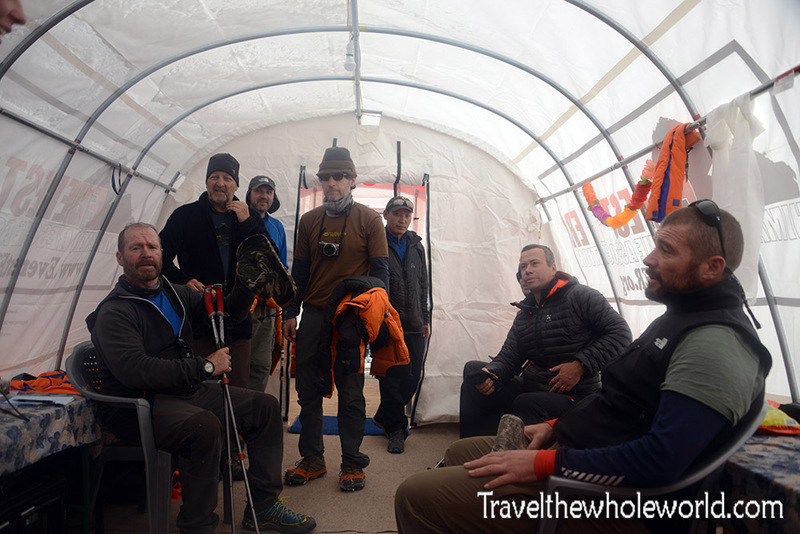 We came and left base camp many times as we acclimatized and recovered in our attempt to get to the highest point on earth. Somehow the first time I entered Base Camp however, I didn’t see this official welcome with the 2016 rock and prayer flags. 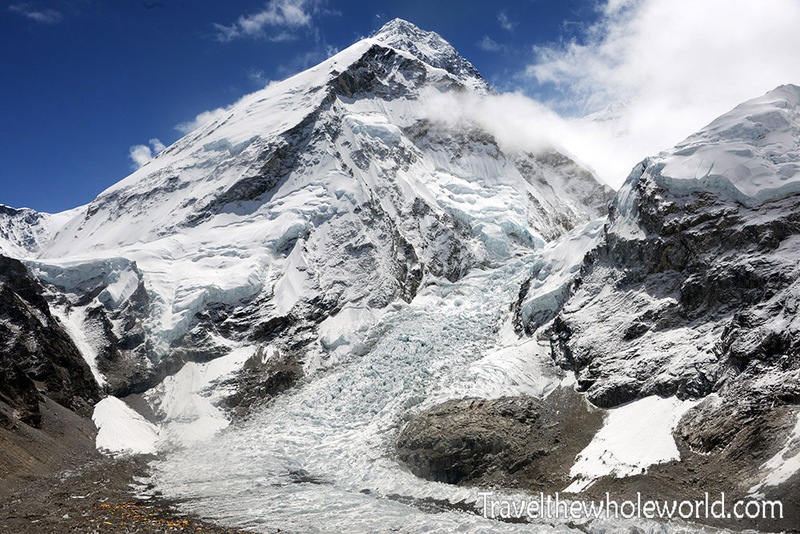 Everest Base Camp is pretty enormous, the largest mountain base camp in the world! Even after we entered camp it still took us another 20 minutes to get to our tents. If you didn’t already know where you’re going, it will be almost impossible to find your expeditions site on your own. These three tents above were part of my expeditions camp, with my tent in the center. 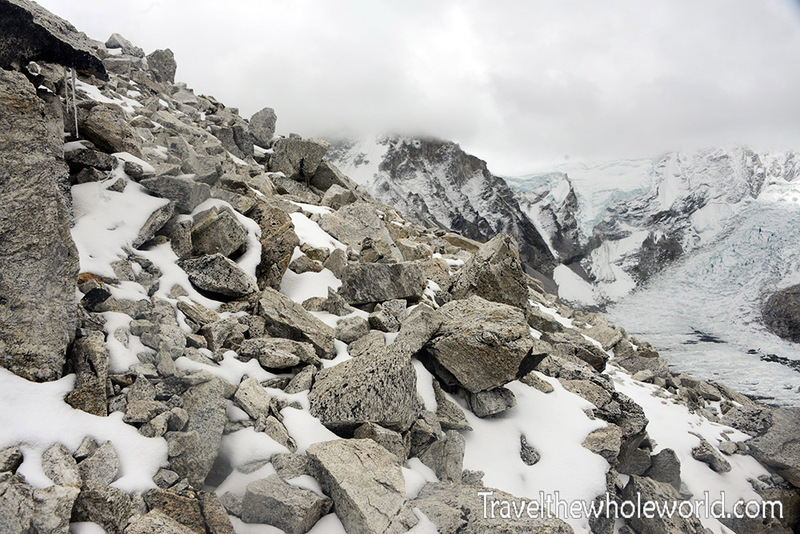 In the background of the photo you can see how far Base Camp extends out, and our site was only half way in Base Camp! The photo above is a shot of another part of my expedition’s camp. You can see the beginning to the icefall in the background! The large yellow tent was our dining tent and one of the blue tents acted as a storage place while the other blue tent was the cook tent. We even had a small shower tent available here as well! The way it works is there’s a large hot bag of water that is hung from the top of the tent. You stand underneath it and wash yourself with a hose. When the water runs out your shower is over. It’s a great feeling to take a shower after a week or two of being nasty. Surprisingly the inside of the tents can get pretty damn hot when the sun is out. The tents trap the heat and taking a shower can be relatively comfortable! 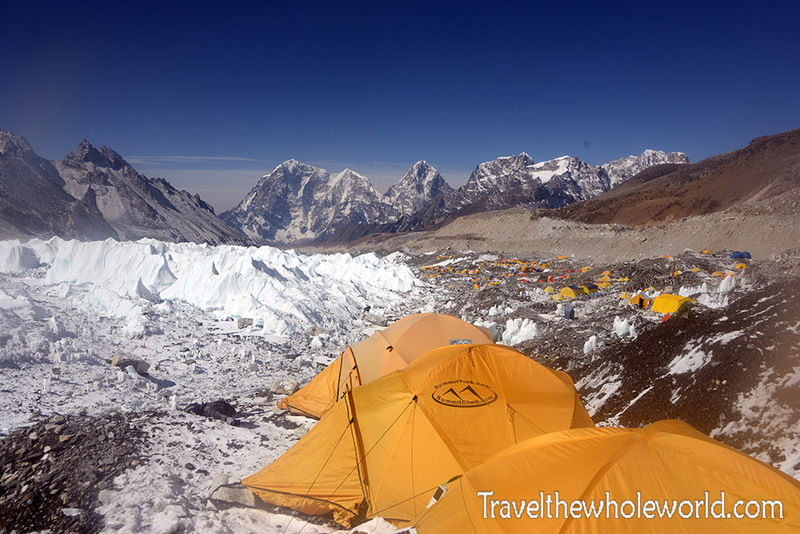 Below is another shot of other parts of Everest Base Camp. I kind of imagined that after arriving to EBC we’d take a few rest days, especially considering that we were now at 17,500 feet (5,300 meters). We actually stayed pretty busy, and on the second day of arriving we did some exploring and all went to the hospital tent. The hospital tent offers insurance for $100. If you make the donation then for the rest of the trip you’ll get free medical advice, treatment, and other services as needed. Of course you can show up later with a medical issue and get treated, but you’ll have to pay a much higher price. I figured I wouldn’t need their treatment but I found myself donating $100 anyway. Nearly everyone on our expedition did. Above is my team in the hospital tent. Coming back from the hospital I got another good view of what I called the ‘Waves’ that form along side Base Camp. 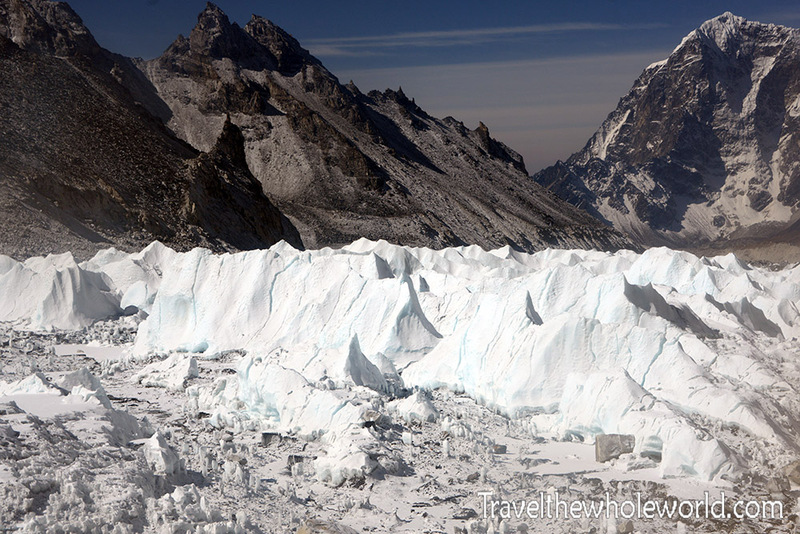 The Waves are just the result of the Khumbu Icefall that changes from crevasses and dangerous terrain to mountains of ice as it hits level ground. I always thought they were one of the most beautiful places in the Khumbu Valley. Aside from the natural beauty of the Waves, the provide an excellent place for training before heading up the mountain. 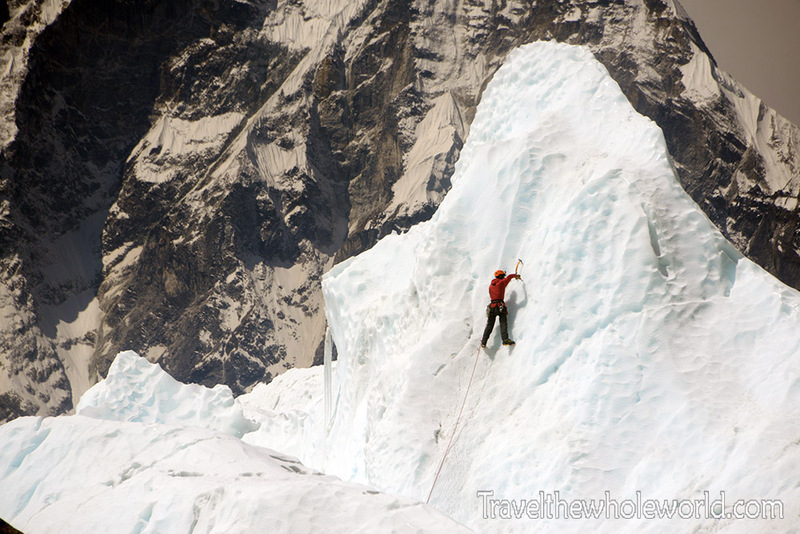 Above is a shot I took of a random guy practicing his ice climbing skills. Below is a shot of myself doing the same thing after spending a few days in base camp. I felt absolutely great at this moment and had no altitude issues or any other problems. Climbing I felt extremely strong physically and everything was going perfectly for me. That night, I woke up and was burning up in my tent despite the fact that ice had formed on the inside. A few hours later I found myself to be extremely cold. As it turned out, I got incredibly sick. Possibly the worst virus I’ve had in maybe five years or even ten. I felt so sick that I had no energy and didn’t even want to leave my tent. I had three or four books with me but I was too tired to pick them up and read them. Normally cabin fever would drive me crazy laying around and doing absolutely nothing, but as sick as I was I was completely okay with it. The only form of entertainment I had was when a fellow expedition member came to visit me or the occasional avalanche outside that was visible from my tent! Needless to say, I was pretty demoralized by now and seriously thought that this could be the end of my expedition. 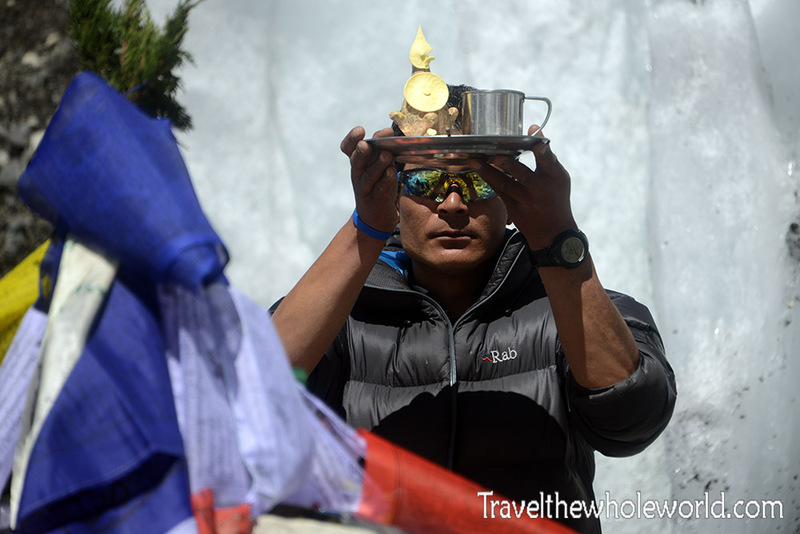 During the middle of my sickness, a monk came to Base Camp and performed the Puja, a religious ceremony that blesses the team and even our gear so that we will have good luck on our expedition. The monk wore a traditional Buddhist robe, but on top of that he had a North Face jacket and normal mountain gear. I was feeling much better than I had been with my sickness, but it was still a struggle to get out of my tent. 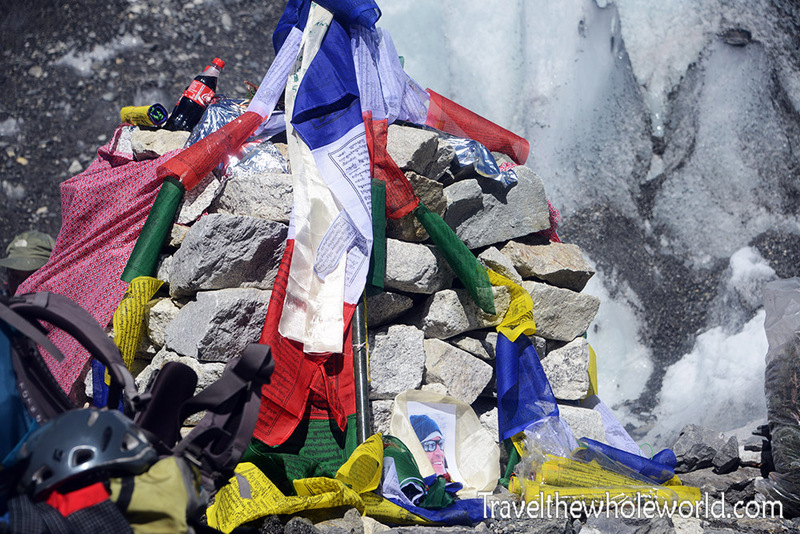 The Puja ceremony involves placing food, drinks and personal items on this formation of rocks that was created. Some people brought more gear than others. As for me I only brought my ice ax. In the photo above you can see a photo of someone who died on the expedition the previous year from an avalanche. Below shows all of our climbing gear that members brought to be blessed. The monk performed a ritual for about 20 minutes that included a lot of singing and chanting. We gathered around in a circle and drank some local form of rice beer, although I thought it tasted more like rice liquor to me. I was scared to drink it since I was sick but had a full cup anyway. After this prayer flags were then extended from the center of the rock altar in all directions. We then had a bit of a celebration and rice and holy water was thrown on us by the monk, and we were covered in white powder. Below is a shot of me in the Puja ceremony. That night my sickness had come back in full force. I had gone to the hospital tent when I first didn’t feel well and they attributed it to just stress and being in the new environment. My expedition leader walked with me to the hospital tent again days later. Without exaggerating I felt hiking that 15 minutes was much more difficult than hiking at 8,000 meters when healthy. This time when I went to the hospital it turned out I had a fever of 102F (39C) among other symptons. I never take medicine, and foolishly I had the cure with me all the time that I had bought in Kathmandu. They told me to take the powerful antibiotics until they were out. I did so and returned back to my tent to rest. Meanwhile, other people were faring worse than I was and helicopters were beginning to rescue people. 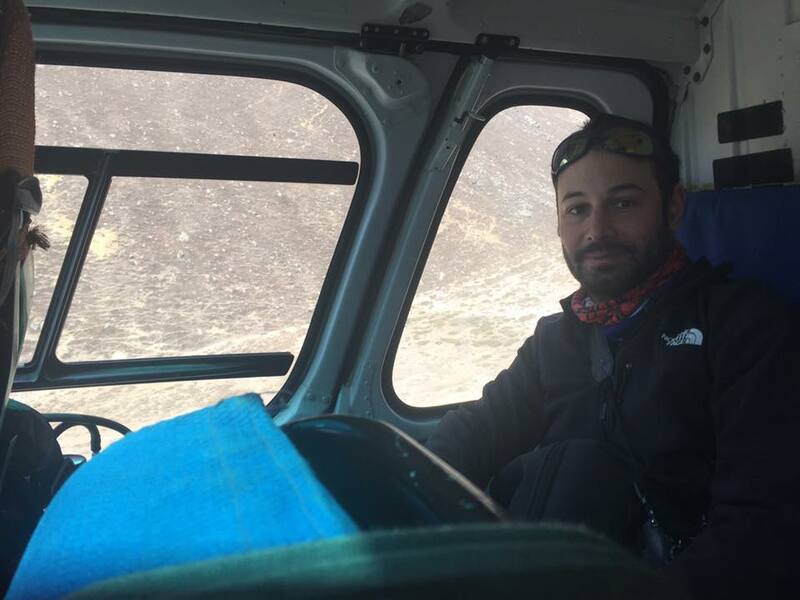 Two hikers on different treks who were just visiting Base Camp had felt sick after arriving and died two days later. Fortunately for me I was fine with the altitude, just had a horrible virus. The medicine I took made an incredible difference. The very next morning I felt weak and fatigued but not sick anymore. The day after that I felt exactly like myself again. I had been too sick to join the team when they did acclimatization hikes to 20,000 feet (6,000 meters) so I was worried about my acclimatization. As it turned out, I proceeded up the mountain and had no issues at all. That part of the story continues on my other pages starting with the icefall. After a successful high altitude climb, I returned to Base Camp in early May. My friend on the trip had developed HAPE, or High Altitude Pulmonary Edema which is a very serious condition where your lungs fill with water. 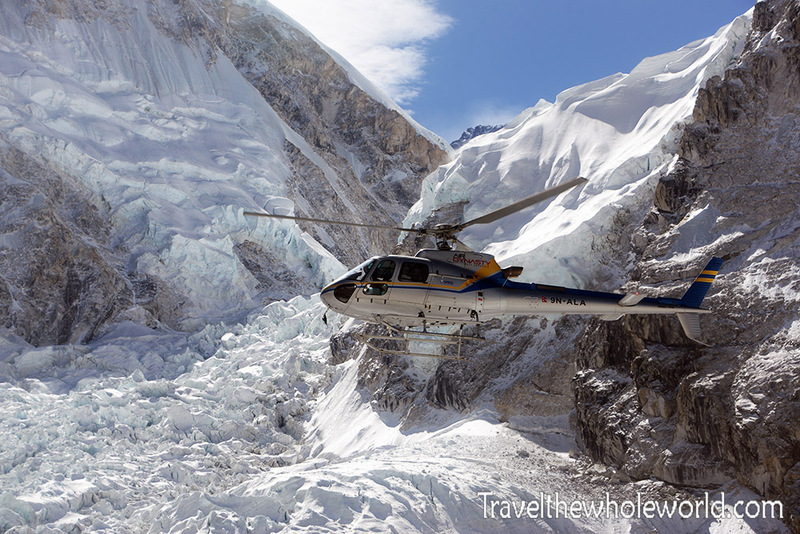 The best cure is to get back to lower altitude as soon as possible and so he took a helicopter down to Pheriche which is about 3,000 feet (1,000 meters) lower than Base Camp. With extra room in the helicopter and a week of rest I took the ride with him! 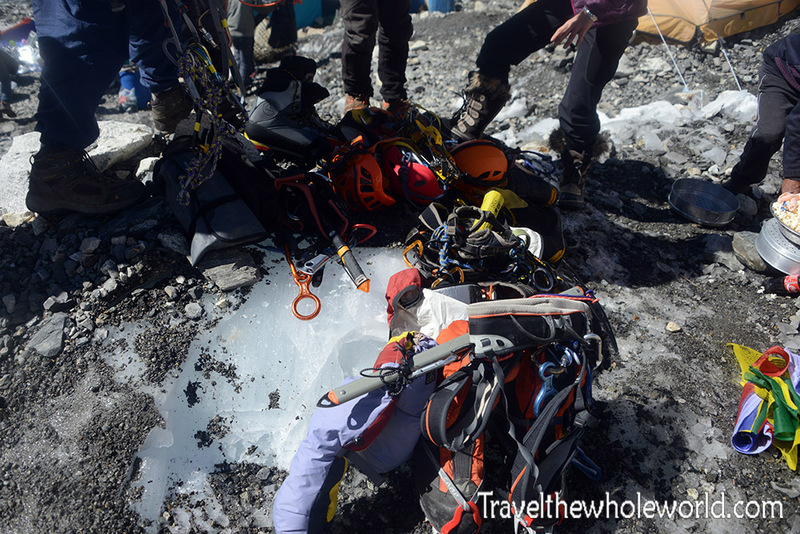 It was very strange to climb up to 23,000 feet (7,000 meters) and be in that brutal environment and then suddenly take a helicopter from Base Camp to a much lower elevation. To be honest it really worried me that I’d lose my acclimatization being so much lower. My friend and I stayed in Periche because there is a good clinic there and he was able to get treatment and get better. There were however lots of other tourists and hikers going around and it just felt like I was notsupposed to be there at all. 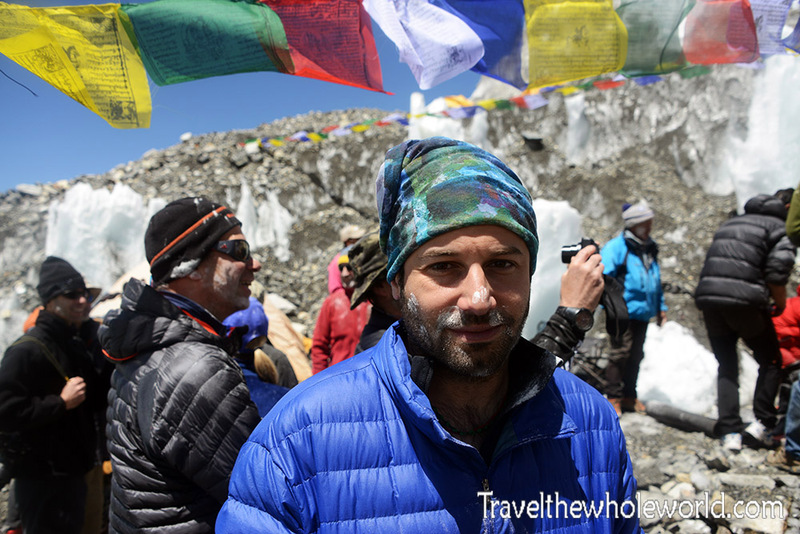 After a few days we hiked back to Labouche and after a full week there we finally returned to Base Camp. 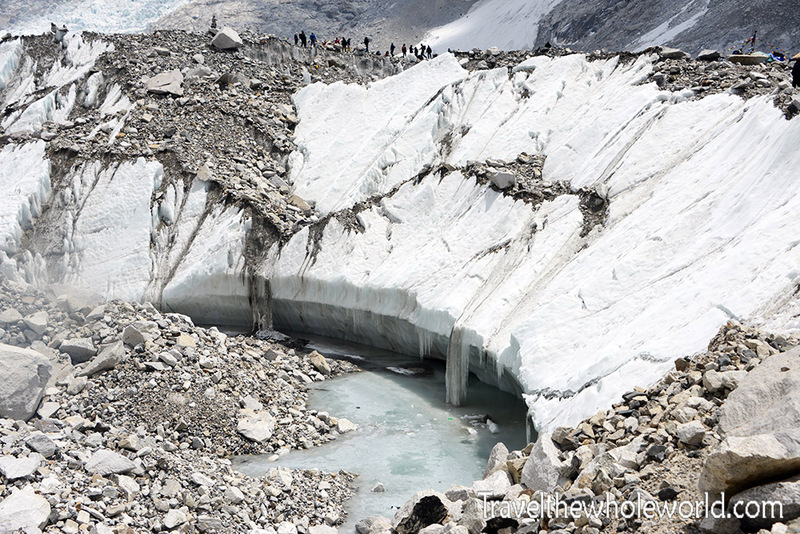 The photo above shows the glacier as you enter Base Camp. 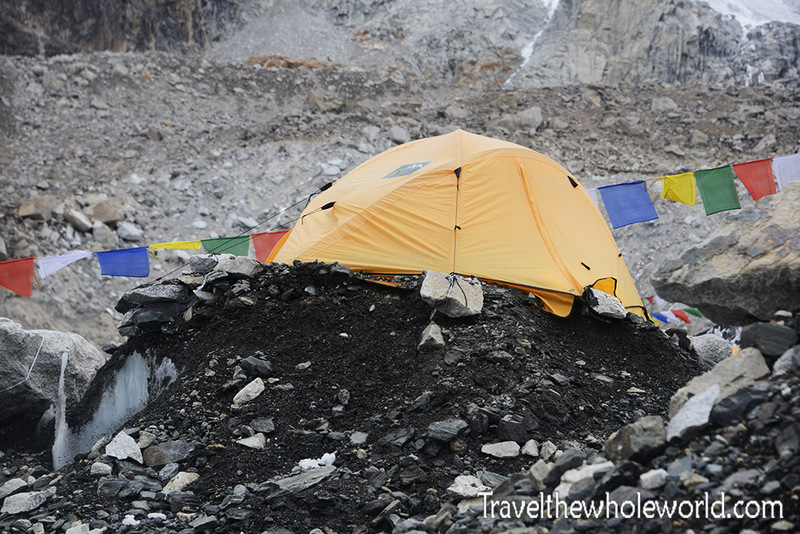 Now that it had been about a month since I was first in Base Camp, a lot had changed! 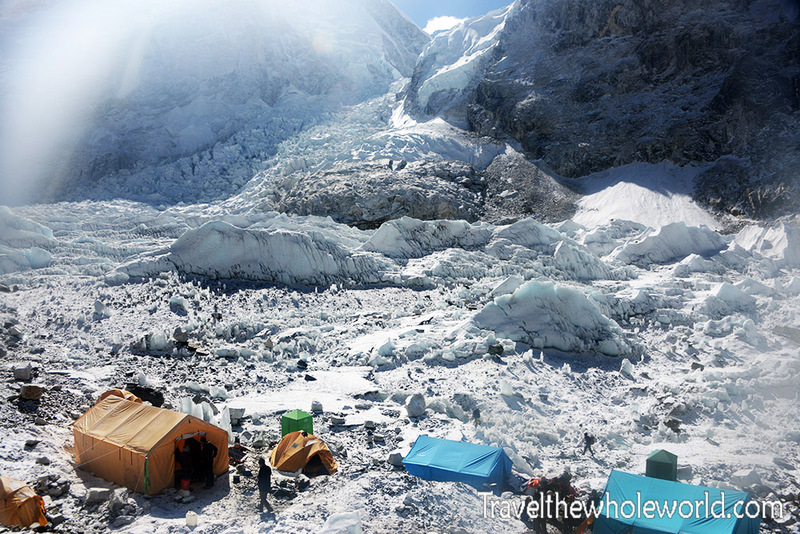 It snowed almost daily in Base Camp, but usually the sun was intense enough to make everything melt by the afternoon. The first time I ever arrived to Base Camp I was a bit disappointed because it look more like a rocky dirt pit than a glaciated valley. 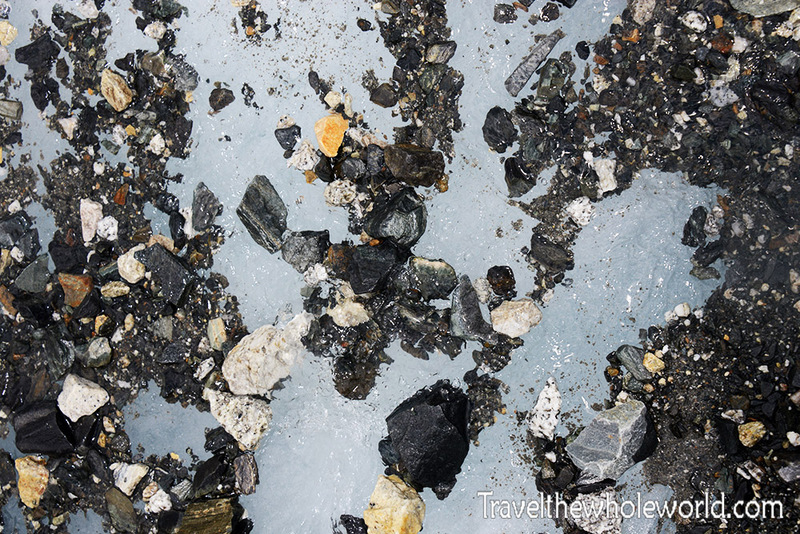 If you look below the rocks like in this photo above you can see all the ice underneath it. 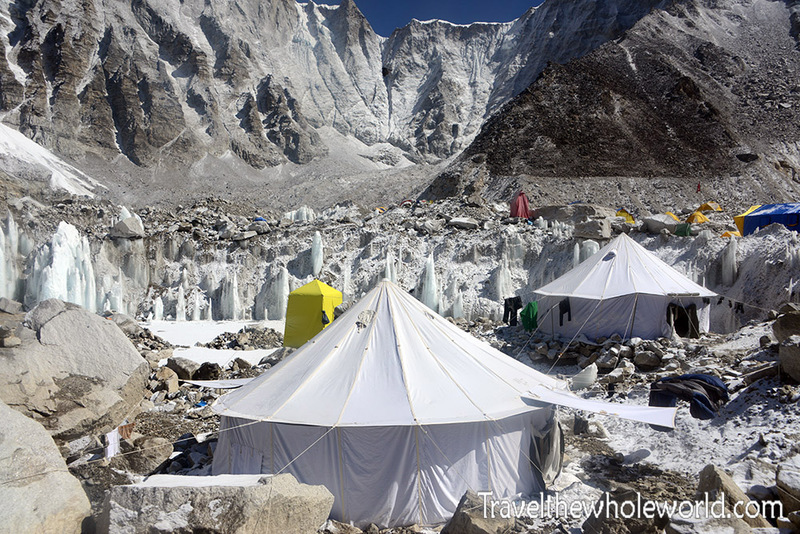 As a matter of fact, by the time I returned much of the glacier had moved and melted from the sun, so our tents were protruded from the ground. It was actually kind of nice though, because when I got back to my tent I could sit on the edge of it in the morning like a chair and put my boots on! After getting back to Base Camp, I was anxious to get back up to high altitude again. Despite being well over 17,000 feet (5,000 meters) I felt like I was at sea level and was terrified I was losing my acclimatization. After being in Base Camp for a few more days after my two week hiatus a friend and I went for a hike up to Pumori Base Camp. 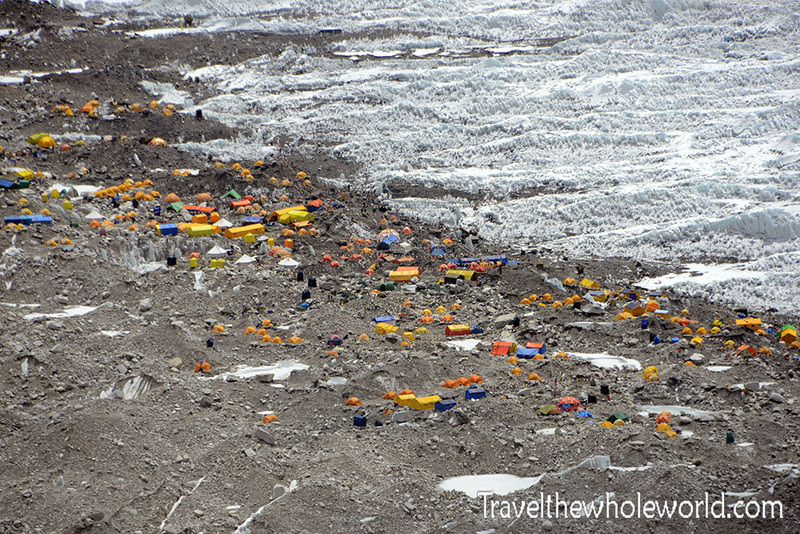 On the way up, I took this photo above which shows the majority of Everest Base Camp. 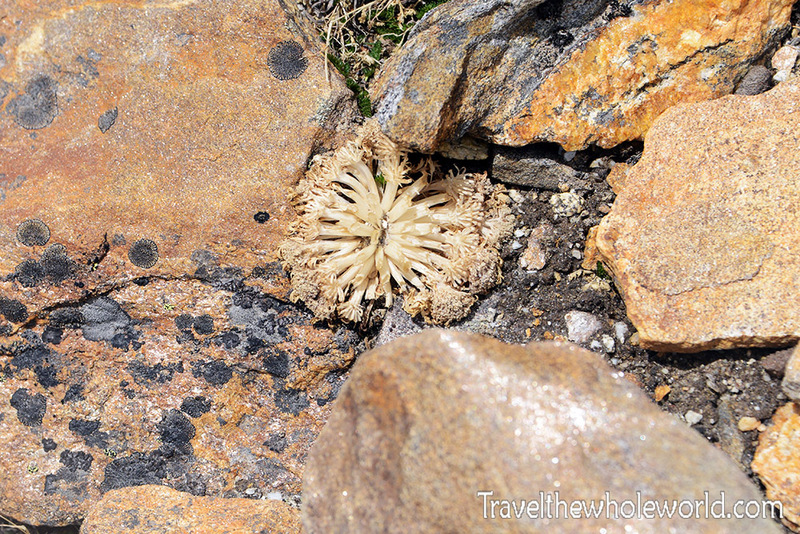 What was absolutely amazing to me was that I came across some strange plants here despite being close to 20,000 feet (6,000 meters)! It had seemed like Labouche which was much lower than here was the cut off for the high altitude plants. Later on I read online that parts of Mt. 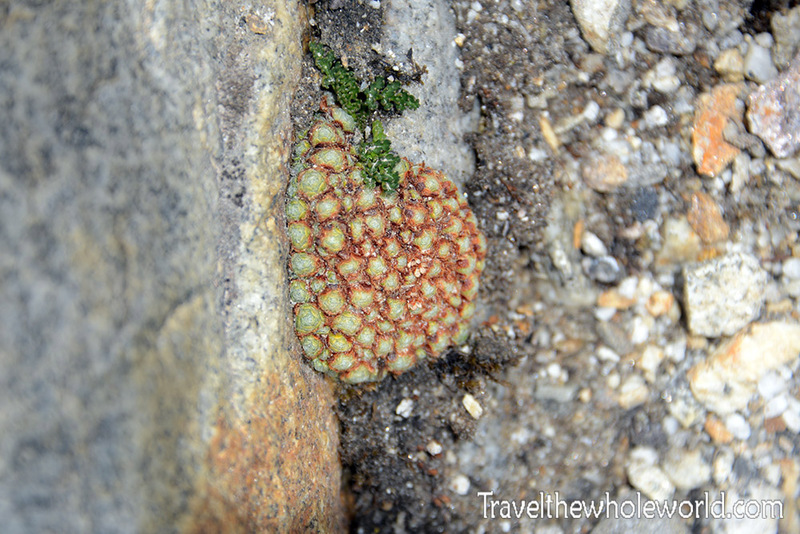 Everest have some type of lichen that can be found over 21,000 feet (6,400 meters) and is the highest altitude plant in the world. I’ve no idea what these species are and it’s just amazing they can survive out here in this brutal environment; especially the winter. The hike was really enjoyable and a bit of a light scramble. The plants we had seen were already pretty rare, but eventually they completely faded out and we finally came up to snow again. 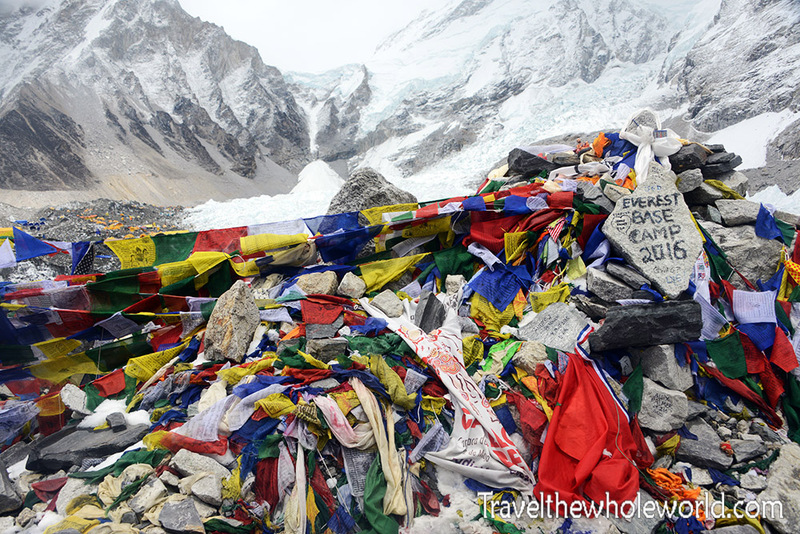 Since Everest isn’t viewable in Base Camp the hike up to Pumori Base Camp allows you to see the top of the world! 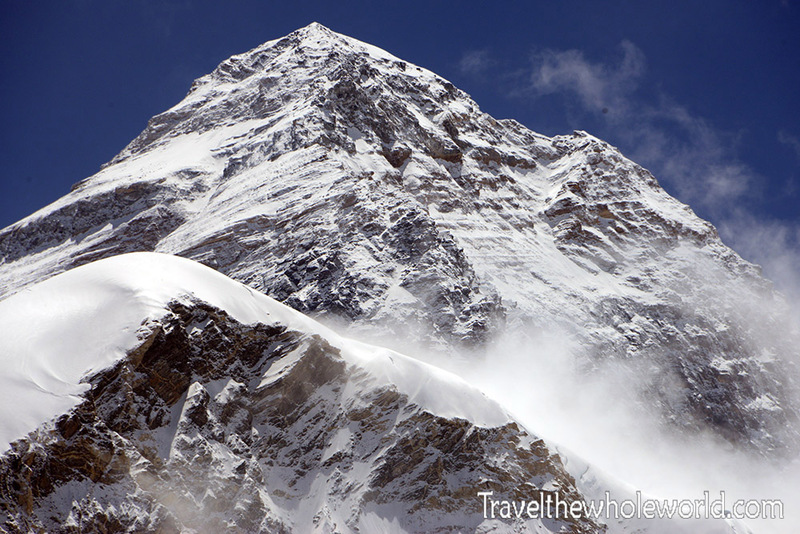 As you can see in the photo above, Everest is blocked by the lower mountain called Lohla Peak when trying to see it from Base Camp. When I was extremely sick the rest of my team had hiked here without me, and I heard them all excited and describing how you could see the entire route from the South Summit. Finally I was able to see it from this vantage point myself, although I had already had much better views from Camp II at 23,500 feet (7,100 meters). Below is a shot of the top of the world taken at full zoom. 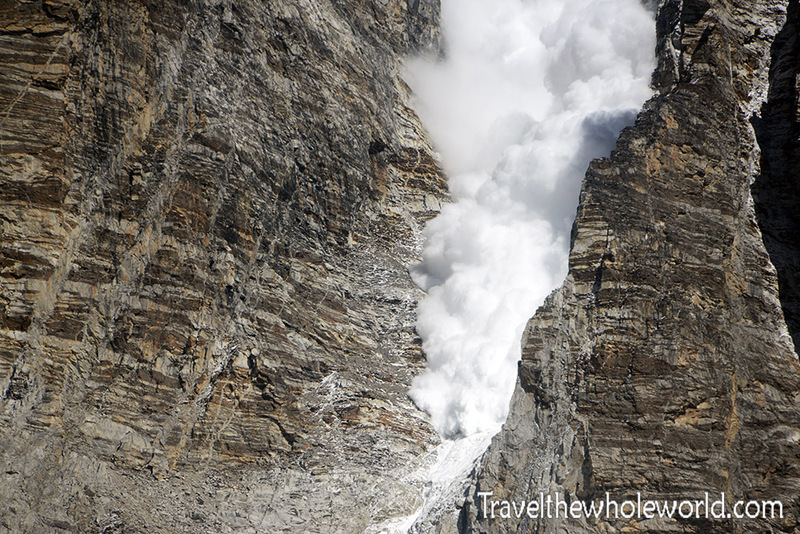 Click here to see the Khumbu Icfall!